The way down into Inferno can be even more fiery if heroes follow the path that takes them through the domains of Ignos, the lava golem! In his molten realm of bubbling magma, heroes will have to be cool and deal with this crazy little thing called lava if they hope to rescue the moody Fallen Angel. 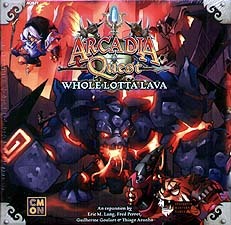 Arcadia Quest: Whole Lotta Lava is an expansion that adds two new scenarios to explore during a campaign of Arcadia Quest: Inferno, introducing new Monsters and a new Angel. Delve into the Molten Cove where Ignos, the lava golem, makes his lair. You'll need to withstand his searing attacks that melt armour while trying to rescue the Fallen Angel. This troubled angel can become a powerful ally to the guild who rescues him, or a monster with wings of fire seeking vengeance if players allow him to be consumed by Inferno. The Heroes' quest will be make even harder by the Hellcats, feline fiends with many lives that are back in the game as soon as they're killed. Conquering the Lava scenarios can grant players powerful new Reward cards and Titles that will aid them in their journey to defeat the Underlord. All you need is lava!